The Virginia Department of Housing and Community Development (DHCD) has partnered with Incremental Development Alliance to provide the Small Real Estate Developer Training and Capacity Building Program, supported with funding from the Virginia Housing Development Authority (VHDA). DHCD and VHDA want to cultivate new and grow the capacity of existing small-scale real estate developers throughout Virginia. Through incremental, small-scale development, we can revitalize neighborhoods, reinvigorate historic downtowns and commercial districts, and build value for property owners and communities around the commonwealth. DHCD will host educational lectures by the Incremental Development Alliance around the commonwealth in March. These lectures will explain common development challenges and detail a series of finance, design and construction techniques specific for completing successful small building projects – both rehabilitation and new construction, as well as discussing the value of small buildings to the local tax base. 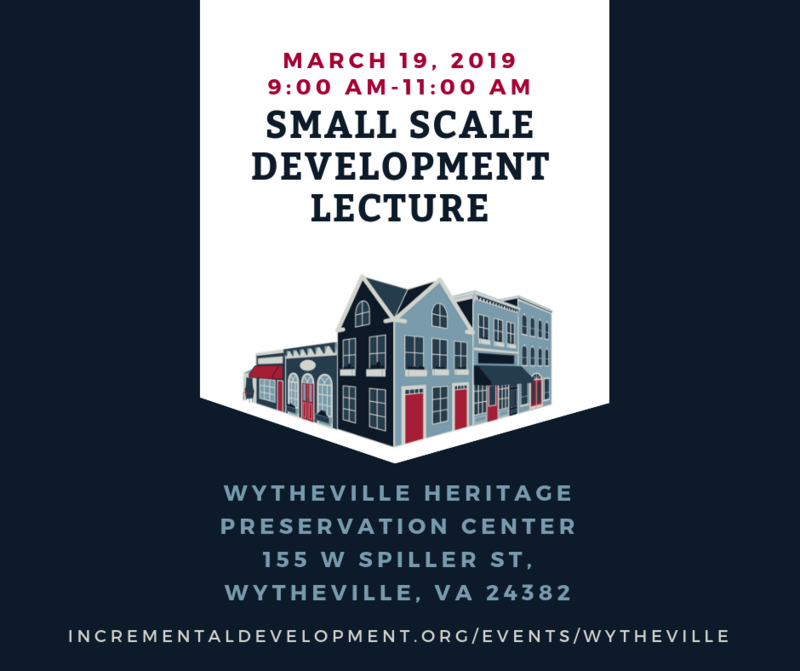 The goal is to building interest in the upcoming workshop (Staunton – May 16 – details TBA) that takes a deeper dive into the “how” of small-scale development. Harrisonburg | Monday, March 18, 4-6 p.m.
Wytheville | Tuesday, March 19, 9-11 a.m.
Petersburg | Tuesday, March 19, 5-7 p.m.
Come learn and network with us!